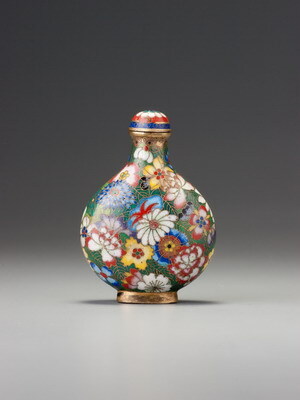 This unique millefleurs-design cloisonné snuff bottle has some features in common with lot 124 in this auction. It is technically as proficient and of a similar range of colours, although they are used with even greater sophistication here. The subject is unique, inspired, no doubt, by millefleurs designs on painted enamels on metal of the earlier part of the century (see, for instance, Sale 1, lot 77). The detailing of the inner neck sets it apart, also. Lot 124 and similar bottles have a flat washer welded to the top of the bottle, creating a shelf-like lip. To construct those bottles, two sheets of copper were beaten into a mould to form the walls of the bottle, which were then welded together; a footrim was added by bending a narrow sheet of copper around on itself, soldering the ends together, and then soldering the entire foot to the body; finally, a washer was soldered to the body to form the lip. In this case (and Sale 2, lot 72), the initial processes are the same, but the neck has a long inner neck made of a separate cylinder without the additional lip. This inner cylinder fills the length of the neck. Another difference between this bottle and Sale 2, lot 72 lies in the thinner footrim and the slightly convex, more crudely enamelled foot. There was no attempt to create a flat foot on this bottle; the enamel is simply painted on, fired, and left with its uneven, undulating surface. 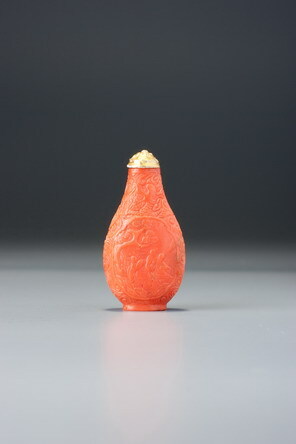 This cylindrical lining of the neck appears on palace painted enamels on metal from earlier in the eighteenth century, and the millefleurs design is a typically imperial one, so there is no reason why this bottle should not be a palace product of the second half of the Qianlong reign. If the palace cloisonné workshops did indeed close down in 1789 (and there is still some question about this), then that might provide us with a terminus ad quem for this bottle. Until we discover more about when private production for the court began to be entertained as a serious option to replace production at the palace workshops and other imperial facilities, however, our attribution of this rare masterpiece of the genre to the palace must remain provisional.